GEO's 19th Annual Conference was open to all individuals interested in attending the event. Registration fees are based on an attendee's GEO membership category and status at the time of registration. For your convenience, we have several registration options available. Please note that registration fees must be paid in full by the deadline to receive early discounts. Tuesday evening of GEO's 19th Annual Conference included private, after hours entry to the Universal Orlando Resort. 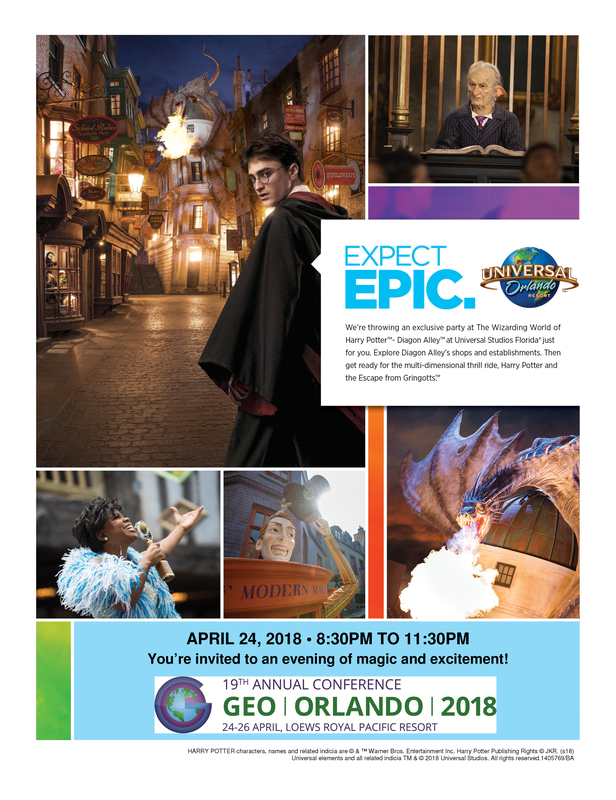 Exclusively with GEO, conference delegates discovered a magical world, whilst experiencing immersive rides, entertainment and enjoying exceptional dining and beverages along the way! This event was inclusive and open to all GEO delegates and their guests. The Event was complimentary for all registered issuer attendees and Universal Event Sponsors. Corporate Issuers are defined as employees of companies that provide equity-based plans and programs as part of employee compensation. Become a GEO member. Provider/Advisor Firms provide services to companies providing employee equity compensation plans. Become a GEO member. Multi-attendee packages available for members. Academic individuals who are affiliated with any non-profit educational or research institutions are welcome to a complimentary GEO Academic membership. Government individuals who are affiliated with a national or international government agency/regulatory body are welcome to a complimentary GEO Government membership.